Love these. Exactly as described. Get the extra firm support you need with this Beautyrest® Extra Firm Support Pillow. Filled with NaturesLoft® fiber for extra comfort, this 400-thread count encased pillow features a 2-inch gusset for additional head and neck support so you can enjoy a great night's sleep, every night. I relied on the reviews of others in deciding to purchase these pillows. They truly are of great quality and are very supportive for side-sleepers like me. Highly reccommend them! These pillows are well made and cause me no problems with my allergies or asthma. I would note however that they are very thick pillows. I usually sleep with two pillows, but with these pillows you may only need one. They are a tight fit in a pillowcase. Very nice pillows, but not traditionally "firm"
First, I will say that I really, really like these pillows. They are quite lofty, seem to be well made, and are holding their shape and thickness well so far (after a month). However, I must also say that I would not actually classify them as 'firm' since they sink down quite a bit under the weight of my head. Fortunately, the extra thickness compensates for their lack of traditional firmness, and actually provides nice support for my neck. I find that I'm sleeping much more soundly and waking up without any neck or back pain. I've gone through several different brands of pillows in the last couple of years (all of which cost more) and these are by far the closest to exactly what I was looking for. I also have high hopes that they will hold up much longer than the others... at least they're off to a good start!! All in all, I am very happy with them and feel the quality and value is great for the price. These pillows are medium to firm and very full to provide good neck and head support. Personally I prefer a medium support and these pillows provide that need. Would highly recommend this Beautyrest Pima Cotton pillow to anyone who wants comfort and support. Firm support and very comfortable. I have never purchased pillows without trying them out first but after reading the reviews I gave them a try...fast shipping and great packaging. Put them in my pillow cases as soon as I received the pillows! Awesome firmness! Holds shape really well..perfect for back and side sleepers. My neck has not hurt since sleeping on these pillows! I'm in Love! Would highly recommend to a friend!! If you need a supportive pillow, this one is for you! I have neck problems and have searched and searched for a pillow that is both supportive and comfortable. I found it here! I would highly recommend this product to friends and family. Ok, this pillow caught me napping! I normally sleep on my side with two pillows, so the set seemed right up my alley... When they arrived (shipping was fast), I realized that I had goofed and should have ordered them singly. At first I put them into a queen size pillowcase until I could get ones for King size pillows. This wasn't one of my brighter ideas, as it ssquished the pillows up, making them thicker ....so I could only use one pillow, (if I had used both, I would have had to sleep sitting upright). I since have put them into the correct pillowcase, and still only use 1 of them. I picked the firm pillow, and can sleep on my side using only 1 pillow. It holds its size and shape all night long, I haven't had to 'fluff' the pillow yet and it hasn't developed any 'low spots'. I wake up feeling better than I have in a long time, and haven't woken up with a stiff neck since I got these pillows. I would definitely recommend this item! As described, if you like firm support as I do, then these are the pillows for you. 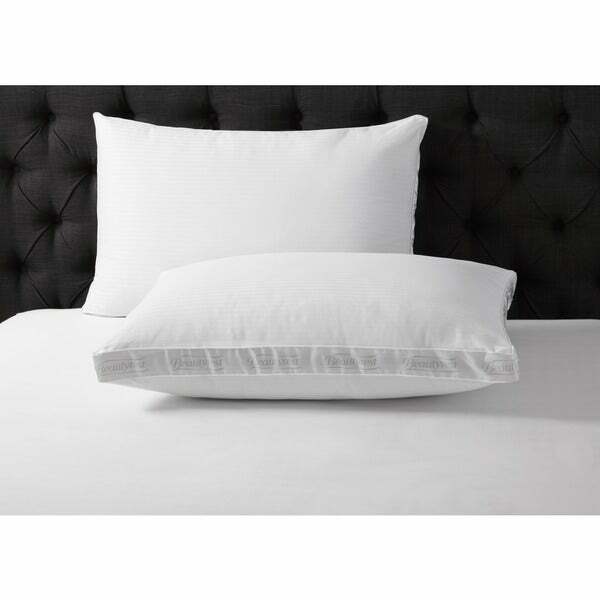 These pillows are soft and comfortable while also providing good support for the neck and head. I am a side sleeper so I like pillows that elevate my head a bit. These do the job perfectly while not being too hard. I would highly recommend. I gave these as a give to my neice going off to college. She just loves them. They are on the firm side and that is how she likes it. They are well made pillows. Thanks again Overstock for keeping my family happy!!! These are really great pillows. I am usually disappointed with the way pillows hold up but these are as comfortable today as when I bought them. Spend the money. You will not regret it. I'm a side sleeper and prefer thicker, firmer pillows. When these pillows first arrived, they were very firm and thick. I've had them just a little over a month now and they are already going flat and are a lot less firm. They are quite a disappointment. I do not recommend. Good quality pillows that don't flatten and I just shake to fluff back up when needed. It's a comfy pillow and doesn't go flat. It's difficult to find that pillow that's right for you. I like firm pillows and these fit the bill perfectly. The pillows were very stiff. Super firm. And don’t really break in great. Pillows are too flat and doesn't hold its shape. Purchased as home warming gift for daughter...she says they are very nice pillows...very comfortable. Very comfortable pillows. They hold their shape well also. Very comfortable and lasted a while. I was expecting to love this pillow and I didn't. It did not fit right in my sham it looked as if I did not have the right size pillow. It does not fit consistently into standard/queen pillowcases or shams. My daughter has the same size sham and it was popping out of the back. It looked awful in the front, it was so tight it looked as if the seems were going to burst. As far as sleeping my head was to high so my neck hurt in the morning. Not a comfortable pillow at all. These pillows are exceptional pillows. For a week I took my time looking thru Overstock's selection because I was buying them for my grandson's room and the new bedroom suit. I read and took notes on the pillows so I could decide which pillows were best for him, I didn't want to spend over *** on 2 pillows since boys will be boys even though they are 16. I felt fairly confident with the ones ordered, after delivery, which of course Overstock ships right away. I took them to him and he was actually excited about how great the pillows were after he slept on them the first time. He had never had the kind of pillows that made a difference for a good nights sleep. It was delightful to so him so happy over 2 new pillows. Overstock is absolutely the best place to shop for most anything, especially things for your home and they arrive right away. I reallly appreciate the exceptional service the provide. "How does this one work for stomach sleepers?" It works for me I'm a stomach sleeper. they have gone pretty flat after a few months of use that's my only thing I don't like about them. I like them and mine have yet to go flat, in fact for me they are almost to thick for stomach sleeping. I don't sleep on my stomach but I think it would work fine. The pillows are pretty soft so they will give with your body no matter which way you lay. I had to use two because they sink down to low and are very soft. "is this product machine washable?" Thank you for contacting us kl580. The product is damp wipe only. Please let us know if you have any further questions. Does it get hot during the night?